“Regency” dance has now acquired a mystique! We all know about “Playford”, but what's this “Regency” stuff? Time for a little investigation. By the way, if you don't know about Playford a good place to start is Hugh Stewart's essay What are Playford dances? and his explanation of steps and figures: Elements of English Country Dance. The Regency was the period when George III's mental illness meant that he was unfit to rule, so his son ran the country as a Regent, with restricted powers. 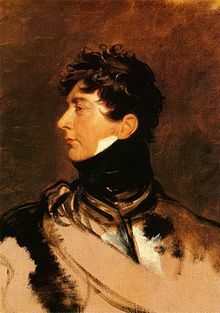 The Regency actually lasted only 9 years, from 1811 to 1820 when George III died and George IV became King, but the Regency era is often considered to be the period from 1795 (when the Prince got married) to 1837 (when Victoria became Queen). It was known for its elegance and achievements (and extravagance) in the fine arts and architecture, much driven by the Prince Regent himself — the Royal Pavilion at Brighton is a perfect example. If the name we associate with English dancing in the 17th century is Playford, the name in the 18th century is Jane Austen. She lived from 1775 to 1817, so she was 36 when the Regency was established (and she died three years before the Regent became King). Would she still have been dancing at such an advanced age? Dancing was for young people in those days! But if we consider the Regency era as starting in 1795 she would have been 20 and she was certainly dancing then. Two more dates for us to consider. The first edition of The Dancing Master was published by John Playford in 1651 and the final editions by John Young in 1728 — nearly 50 years before Jane was born. During that time the English Country Dance had been through a major change. In the first edition there were lots of set dances — for two, three or four couples, squares and circles, often with the “Playford” introductions of Up a Double, Siding and Arming. By 1728 the longways triple minor was king. No, Jane Austen didn't dance “Playford” — that was 100 years ago and she would never have heard of him. Country dances were still popular, especially in the earlier part of the period, but I'm assuming that readers of this page are familiar with them so I'm concentrating on the less familiar forms. If you want a good example of country dances (and much else beside), on the left is a link to the BBC's production “Having a Ball” which tries to recreate the Netherfield Ball from Jane Austen's “Pride and Prejudice”. The version I originally linked to has been taken down because of copyright infringement, so here's a much inferior copy (unless that gets taken down too). They only got through two dances before supper and two after supper though! And the thing which sets “Regency” dancing apart from “Playford” dancing in the 21st century is that Regency dancing is done with steps. There are various Regency dance groups around the country, such as Hampshire Regency Dancers in Winchester who have a page of links to other organisations. Some of the people in these groups are more interested in dressing up than in learning how to dance, though some certainly take the dancing seriously. But, you ask, didn't they do steps in Playford's day? Of course they did — the “Dancing English” were famed throughout Europe — but nowadays the image of Playford as established by most EFDSS-type clubs is that it's almost all walked. The same is true in the States, and I believe in other countries too. No, they didn't walk the dances in 1651, but the EFDSS influence is so strong that (I imagine) Regency dance groups want to distance themselves from that image by using a different term, even though they will then dance “Black Nag” (1670), “Juice of Barley” (1690), “Hole in the Wall” (1695), “Mr Beveridge's Maggot” (1701), “Turning by Threes” (2003) in addition to dances of the Regency period. So what steps did they use? The good news is that for country dances you will normally get by with a skip-change step, possibly a slip-step, and the same setting step that you're used to. To be more authentic you should finish the skip-change step with a little jump, ending feet together, rather than blurring the edges and going straight into the next figure. Thomas Wilson's “The Complete System of English Country Dancing” from 1815 includes Chassees, Jetté Assemblé in lots of moves, starting right at the beginning with Turn Your Partner (Two-Hand Turn) and Swing Round Your Partner (Right Hand Turn), and continuing through Hands Four Round (Circle Left) and Back to Back (which he calls an Allemande, a source of endless confusion!). So it would appear that some people did use Chassees, Jetté Assemblé extensively in Country Dance in that period. Since many of the dancers I work with are not as sprightly as they used to be, I quite often just pick one figure in a dance and encourage them to do the stepping in that figure. E.g. in Kitchen Lancers I will suggest they try it in the Ladies Around the Men, and the Men Around the Ladies. It usually gets a very good reaction that way, whereas trying to get them to step throughout the dance can be too tiring. However in a Quadrille, to be authentic, you need to replace the final skip-change with a Jeté Assemblé. If you start the skip-change on your right foot, you will start the final bar of music on your left foot. Step onto your left foot while throwing your right foot out forwards and to the right — it doesn't have to be that far — then jump, landing on both feet, bending your knees to avoid injury. I'm not going to go into all the foot positions, the turnout and so on — this is just a basic introduction for English Folk Dancers who are used to walking everything and I don't want to scare you off completely! “Jeté” means “thrown” and “Assemblé” means “assembled”, so just remember that you throw one leg out and then bring everything together again. Adding the steps to the dances changes the quality of the movement considerably as every figure is punctuated by the jeté, assemblé. Some modern dancers are becoming more interested in these steps, but for the majority of social/recreational dancers this is an unnecessary complexity — it's also quite tiring to keep it going throughout a complete dance. It's great that Anne Daye continues to promote this aspect of country dancing as it adds a whole new dimension to the experience. Although you write “dancing was for young people” — this may have been the case in the elite ballroom, however there are many of accounts of older people dancing in other situations. I wonder if anyone has studied this area in detail. In some cases you might want to use the Allemande step, which is a slight spring forward on the right foot, landing on a flat foot, followed by two steps on the toes, left and right, followed in the next bar by the reverse. If you were to split a bar of reel time into four equal parts, both the skip change step and the allemande step have you moving on 1, 2 and 3, so they actually seem quite similar to me — or perhaps the allemande step is more like a pas de bas. Different people will give you different descriptions of the Allemande Step. I found some YouTube videos but Anne points out that the allemande has been a dance form since mid-16th century though much changed across time and neither of the videos bears any relation to the Regency era, so I've taken the links out — search YouTube at your peril! If you venture into cotillions you will probably need the Pas balancé and Rigadoon (or Rigaudon) steps — see later. Read more about steps (and the entire First Set of Quadrilles) here. The English spelling is “Cotillion” or occasionally “Cottillion”, pronounced with the emphasis on the second syllable; the French spelling is “Cotillon” with the emphasis on the third syllable. Some books (certainly when we come to the Quadrille) give both English and French wording for the figures. G E N E R A L R U L E S for D A N C I N G C O T I L L O N S.
The M U S I C. The first strain of all Cotillons is played twice for the Changes, and the Figure always begins with the second Strain. The Strains must be repeated exactly as they are marked in the Music. The C H A N G E S. The Changes are a Kind of Introduction to the Figure of the Cotillon, and may be varied as often as the Dance is repeated. Each Change, as was observed before, must take up the first Strain of the Tune, played twice over. A Cotillon always begins with bowing all together in their Places, as in a Minuet, which must employ the first Strain, played once. Then all Ballancé and Rigaudon, and large ring half round, turning to the Right. This takes the first Strain the second Time. Ballancé and Rigaudon, and come back with the Ring, turning to the Left to their Places ; which takes in all the first Strain three Times, including the Bowing. Then the Figure begins with the second Strain. Ballancé and Rigaudon (the Partners facing each other) turn both Hands quite round, beginning to the Right. 1. Strain 1st Time. Ballancé and Rigaudon, and turn as before to the Left. 1. Strain 2d Time. The four Ladies Ballancé and Rigaudon and Moulinet, i.e. Hands across, with the Right Hand quite round. 1. Strain 1st Time. Ballancé and Rigaudon, and Moulinet with Left Hands back to their own Places. 1. Strain 2d Time. The four Gentlemen Ballancé and Rigaudon, and Hands quite round to the Right. 1. Strain 1st Time. Ballancé and Rigaudon, and Hands round to the Left to their own Places. 1. Strain 2d Time. All Ballancé and Rigaudon, each facing their Partners, Allemande with the Right Hand quite round. 1. Strain 1st Time. Ballancé and Rigaudon and Allemande, with the Left round to their Places. 1. Strain 2d Time. All Ballancé and Rigaudon, turn half round in a Ring, holding Hands. 1. Strain 1st Time. Ballancé and Rigaudon back to their Places, half round. 1. Strain 2d Time. All Ballancé and Rigaudon and large Ring, half round to the Right, beating Hands. 1. Strain 1st Time. Ballancé and Rigaudon and large Ring as before to the Left, which brings all to their Places. 1. Strain 2d Time. N. B. The Changes of every Cotillon, where there is no Ballancé and Rigaudon, will be expressed at the Bottom with proper Instructions. The S T E P S used in C O T I L L O N S are only eight, viz. 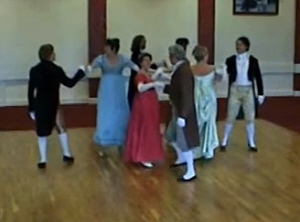 A small Attention to the foregoing Rules, and the Instructions annexed to each Cotillon, will in a short Time, enable any Lady or Gentleman to perform these Kind of Dances, if they are acquainted with the Steps ; a thorough Knowledge of which may be acquired in a Fortnight, by the Assistance of a Master. Anne's book “More Dances for Jane Austen” gives guidance on cotillons. You can read about and order it at historicaldance.org.uk/publications/page/2015 and it comes with an accompanying CD of the music. Anne has given me permission to reproduce one of the dances from the book, though I'm rephrasing it in the way that (I hope) English Folk dancers will understand. Dance and Music: “Six New Cottillions and Six Country Dances with Three Favorite Minuets… composed by Nicholas Lemaire”, 1773. Music: (AABBCC) x 4 + A. 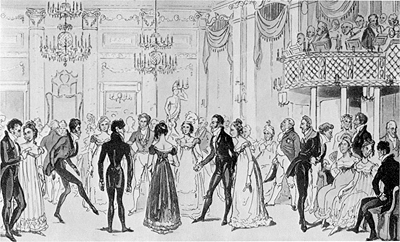 A cotillion consists of a Figure, unique to that particular dance, and the Changes which were (fairly) standardised — the equivalent of Up a Double, Siding and Arming. For some reason the first Change isn't called the first Change, so here I'm calling it “Introduction”. You dance the Introduction, the Figure, the first Change, the Figure, the second Change, the Figure and so on, ending with the final Change — and there could be 9 or more Changes, though people probably don't do so many now. The Introduction and the final Change were “Le Grand Rond” which is a slipped circle right and then left. The other thing that most of the old books don't mention is that there is usually stepping before each half of the Change. You would expect “Circle right and left” to take 8 bars — 8 slips in each direction — but in most cases each was preceded by Pas balancé and Rigadoon. I imagine the Pas balancé comes from setting, but the trailing foot doesn't actually touch the floor — you step with the right foot to your right, bring the left up to it but without touching the floor, then repeat to the left. Starting in first position, in bar 1, beat 1 hop on the L foot extending the R to the side and replacing it to first; on beat 2 open the L foot to the side (without hopping) and replace it to first; conclude the step with a jump in first position on the first beat of the second bar. (Then make a preparatory step in the direction of travel). That “preparatory step” may catch you out! A lot of cotillion tunes start with half a bar upbeat, and you move on that rather than waiting for the bar-line. So if you're doing a rigadoon followed by the Grand Ronde, the final beat of the rigadoon is where you start to slip to the right. A simple alternative for present-day dancers is to set to partner twice. But if you want to try the real thing, my mantra is: Step right, pause | step left, pause | hop, change, down | jump. (and then start the circle). You will see plenty of bogus Rigadoon steps on YouTube videos! Anne says this cotillion has the stepping in the introduction but doesn't have stepping in the changes — that's why I've chosen it! The instructions say that Le Grand Rond is 16 bars, but Anne explains that there's actually an extra A-music for honouring your partner: 4 bars doing nothing, then step right and bow or curtsey. (Some people honour on the first four bars and do nothing on the second four.) The Figure takes 40 bars, so we need to steal one A-music to complete it, leaving only one A for each of the Changes and therefore no time for the stepping in the changes. The word “Allemande” can mean various turning moves. In this dance it has two meanings. The Allemandes at the start of the figure are done thus. Link right arms with your corner but don't bend them as if you were doing an arm right. Instead stretch them out behind the other person's back, put your left hand behind your own back and take the other person's right hand. Turn once around, looking at the other person. But with an allemande turn in the next move is interpreted here as turning the lady under the man's arm. You can read much more about the many different meanings of the allemande figure at https://www.regencydances.org/paper001.php. A1: Nothing for 4 bars. Step right and honour partner. A2: Pas balancé and Rigadoon. Circle right (slip-step). A3: Pas balancé and Rigadoon. Circle left. B1: All allemande right with corner. Allemande left with partner. B2: All give two hands to partner, head men move slightly to your right, side men to your left, and head couples half poussette with the couple on their right (ones with twos, threes with fours) — head men pushing, side men pulling and the heads passing outside the side couple; men let go with your left hand and turn your partner clockwise under your right arm without going anywhere yourself. Do the second half of the poussette, and again turn the lady under — anti-clockwise might flow better into the next figure. C1: Ladies right-hand star half-way (four allemande or skip-change steps). Left-hand turn the opposite man, and the men do a courtesy turn (without putting your arm round her waist) to finish all facing in, man on the left. C2: Men left-hand star half-way. Right-hand turn partner to finish back in the square, all half-way round, facing partner. A1: Grand chain half-way to return to places. A2: Right.hand turn. Left-hand turn. A2: Two-hand turn. Reverse two-hand turn. A2: Circle right. Circle left. The move in C1 and C2 is similar to “All four ladies chain across — all four men chain back”, but you have twice as long as you would in an American Square, so don't rush it — four dance steps for the ladies to star half-way, and do a proper open left-hand turn with your opposite, men moving forwards throughout. And yes, it's all danced, with an allemande step (or maybe a skip-change step), and a slip-step for the big circles, though Anne says that if you use small circles (two couples) these are danced with a skip-change step. The step for this should be the allemande step […] We can only make an informed guess about basic step in cotillons. My rule of thumb is to use the allemande step for duple and 3/8 tunes (allemande couple dances were in these metres) and skip-change for 6/8. Although it is likely that they often used demi-contretemps, and a full contretemps or gavotte step. And there are minuet sections too in some. One explanation of the steps is found at https://www.regencydances.org/steps.php. On the same site you can read about the Dance Style and a great deal of information about the Cotillion. You might also want to look inside The Extraordinary Dance Book. Modern 'Regency Dancing' is a mixture of history and fantasy. We don't want to recreate a historical Ball perfectly: we'd need an army of servants, removal of amplification, dancing throughout the night, lots of standing around waiting to be involved, the active couples at risk of exhaustion (individual dances might last 15 minutes or longer), weird class-related privileges… and so forth. And the tickets might cost a fortune! Modern Regency dancers want to have fun: we convert triple-minors into three-couple sets, make bland figure sequences more interesting, dance to favourite tunes regardless of the date, and so forth. Many of us are aware of the anachronisms, some find irony in the invented traditions, but ultimately it's a compromise; different groups handle that compromise in different ways. Many of us do invest the time and effort to better understand the historical context, but most are happy just to enjoy the dancing for what it is. Oh, and Grrr Napoleon, long live King George, and boo to chaperones! If anyone out there would like to attend a Regency Ball, you'll almost certainly enjoy it. 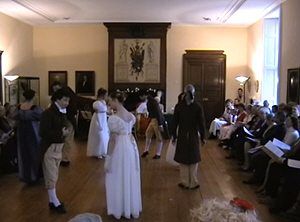 Many such events are listed here: https://www.regencydances.org/events.php. I myself dance with the Hampshire Regency Dancers — we're not that different from a regular folk dancing club, but we also enjoy the opportunity to entertain and educate the public at some wonderful historical venues. Paul says that the other main difference apart from the steps is the music. With respect to music I was thinking more about the social history. I have a theory that the improving musical technology had an effect on the social dancing styles: there were more pianos in private homes, operatic music would be rearranged for dancing (especially for Quadrilles), composers (perhaps) had the dancing after-market in mind for promoting their work. It's all just a theory, but I suspect a lot of the printed dance music that was sold was bought by people learning to play instruments, and would have been used for social dancing at private homes. The Quadrille in particular was an at-home dance; you could dance it with a few friends, memorise the choreographies, then dance it out and about — you just needed someone to play the piano. I would add that we can be confident that the dance music was being sold for the amateur home player (not just a theory). We know Jane Austen played for country dancing at home, and there is other supportive evidence. Let alone that no professional band would need such simple stuff. I agree that the music is very different in style from the early Playford. To me it sounds like chamber music, and not particularly adventurous chamber music either! It's in 8-bar phrases, and usually the second four bars are a repeat of the first four bars with a slightly different ending in the last bar or so. Usually the first four bars end on the dominant and the second four bars end on the tonic. It's “pretty” music, but to me it doesn't have the majesty of “Fain I Would” (1651) or “Mr Beveridge's Maggot” (1701), nor the energy of “Black Nag” (1670) or “Parsons Farewell” (1651). I agree with the light and trivial nature of the cotillon dance music, but, note that the tunes often have mineure sections (see La Brunette) matching the 'story' of the dance, and also mix different metres. Our next collection will have one with minuet, duple and 3/8 sections; the first Jane Austen collection has some. Early 18th century English and Scottish country dance tunes are the greatest, I agree. 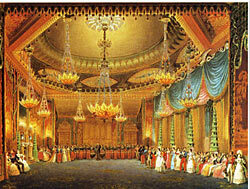 The cotillion was popular during the first two decades of the nineteenth century — Jane Austen enjoyed dancing cotillions. It was then gradually replaced by the quadrille, which dropped the standard set of changes and just concentrated on figures (in the plural). In fact the change-over wasn't as simple as that, and some people (including publishers) still referred to quadrilles as cotillions and vice versa, making for much confusion among researchers. It seems unlikely that Jane Austen danced quadrilles, but they were certainly around in the Regency period. I understand that originally there were just a few quadrilles, and gradually others were added, though most of these were variations on one or more figures of the Plain Quadrille. However there were many many sets of tunes for quadrilles. A quadrille normally had five figures, and music publishers would regularly publish new sets. For instance at www.gsarchive.net/articles/arrangements/dance_music.html you can find links to music from many Gilbert and Sullivan operas arranged for quadrilles — see the link at the bottom of the page. That was after the Regency period, though I imagine Jane Austen would have enjoyed Gilbert's sense of humour. My gateway to original sources is an amazing collection of links at www.libraryofdance.org/manuals, part of The Library of Dance curated by Nick Enge & Melissa Carvell. The earliest music there (complete with figures) is from 1816. When I was creating this page, Paine's First Set wasn't there — I contacted Nick and he has now found a copy (though missing page 6). So I looked at the Second Set: www.libraryofdance.org/manuals/1816-Paine-2nd-Set_(Powers).pdf. The title page gives the publisher as “Paine of Almacks” — Almack's was an upper-class assembly room in London where these quadrilles were danced, and James Paine was the band leader there for many years. The instructions are given in both English and French: here are the English versions. In this set French words also appear in the music to make it clear how the movements fit to the tune. Right and Left, Balancez and turn your partners with both hands, Ladies chain entiere, Promenade half round, half right and left. Opposite Lady and Gentleman advance and retire, Chasse to the right and left, cross over, Chasse to the right and left, back again, Balancez and turn to your partner. Opposite Lady and Gentleman cross over giving their right hand, back again giving their left and their right to their partner, the four balancez in line holding hands Ladies fronting one way and Gent: the other, Promenade half round, opposite Lady and Gent: advance and retire; back to back, four opposite dancers advance and retire, half right and left. Ladies chain entiere, Balancez & turn your partner with both hands, opposite Lady and Gent: advance and retire, Chasse to the right and left, cross over chasse to the right and left, back again to your place, half Promenade, half right and left. The Grand Round, four opposite dancers advance and change partners, the four advance again and resume partners, balancez and turn with both hands, right and left, double promenade to your places. In No. 2 the French version ends Balancez — un tour de main making it clear that the English should be Balancez and turn your partner rather than Balancez and turn to your partner . Click the image on the left to see a superb display of Paine's First Set by the Dutch group Nederlands Historisch Dans-en Theaterensemble. There are elements of interpretation which some would argue with, but the style is wonderful and I believe it conveys the way it would have been danced in 1815. It has six figures, the fourth being “Trenis” which was sometimes danced instead of “Pastorelle” though sometimes both appeared, so maybe I'm wrong to say that the standard quadrille had five figures. For display purposes they have cut down some figures so that only two men lead them; normally each man would lead the figure in turn. On the right you can see Ellis Rogers and members of his Quadrille Club dancing the same set. This has the figures in full, and therefore because of a YouTube restriction they could not fit in “Trenis”. Persons wishing to have PAINE of ALMACK'S Quadrilles, are requested to observe that Mr. Paine's Signature is written on them, and that no others are genuine, which will prevent Imposition, as a Spurious Edition of the Quadrilles , has lately been published. The link to the music above also includes a simplified version of the Finale as the original becomes unplayable towards the end! Right and left, Balancez to your partners and turn, Ladies chain, half promenade and half right and left. Opposite Lady and Gentleman advance and retire, chasse to the right and left, cross over, chasse to the right and left, back again, Balancez & turn your partners. Opposite Lady and Gentleman cross over giving their right hand, back again giving their left and their right to their partner, four sett in line holding hands, Ladies fronting one way and Gentlemen the other, promenade half round, opposite Lady and Gentleman advance & retire; back to back, four opposite dancers advance and retire together, half right and left. All eight chasse across, opposite Lady & Gent: advance & retire, Chasse to the right & Left, Cross over, Chasse to the right & Left, Back again to Places, Balancez & turn your Partners, The Gentlemen turn the Ladies on their Left with both hands half round & form two Opposite lines, all Eight advance and retire, turn your Partners to Places, the Grand Promenade all round,Chasse Eight for the finale. This is based on the “Plain Quadrille”. The names of the standard figures are Pantalon (Trousers), L'Eté (Summer), La Poule (The Hen), Pastorale (Pastoral) and Finale (Final), and you can see that Paine has given these in brackets after four of the tune titles. In the picture of Almack's above you can see them dancing Pastorale. We danced my version of the First and Fourth figures in the Connections workshop, so let's try my version of the Third and Fifth figures. Musicians: Play (AB AC) x 4, then final A. A: Nothing for four bars. Step right and honour partner. B: First lady and her opposite man cross over giving right hands. Cross back giving left hands, keep hold and give right to partner's right forming a wave up and down the set. A: Set right and left in the wave twice, with eye contact. Take a cross-hand hold with partner and promenade across to the other couple's place. Note that the first couple are promenading with the man on the right, so instead of wheeling around as they reach the other couple's place they just face in. C: First lady and her opposite man forward and back. Back-to-back. A: Both head couples lead forward and back. Half right and left. Second lady (on left of first lady) lead the same figure (apart from the initial honours), then third lady, fourth lady. Some people will say that the figure should be led by the first man rather than the first lady. I've been guided by the fact that the wording says Opposite Lady and Gentleman rather than Opposite Gentleman and Lady but I'm not saying that I'm right. Similarly in B some people slap hands as they pass, whereas the wording says giving their right hand . There's a lot of time for both lots of crossing, so don't get there too soon — look at the Dutch video to see how well they time it. Musicians: Play (AAB) x 4, then final AA. Strangely enough, the finale usually includes L'Eté in its entirety, and it does so here. But this figure is different from the Finale of the first set, so more interpretation is needed. I'm not pretending to be an expert on quadrilles, but here's my opinion. The A-music is 8 bars repeated and the B-music is 40 bars. Normally the honours are during the A-music and we start the figure on the B-music, but in this case there are two A's, so we start the figure on A2, then 40 bars of B, then finish the figure on A1, ready to start the next turn of the figure on A2. We then have an extra A2 after the last turn of the figure — but that's all right because the instructions finish (on a separate line, to show that it's an extra): Chasse Eight for the finale . And that means every A2 is the chassé across. So we have 48 bars to play with for the figure. A1: Nothing for four bars. Step right and honour partner. A2: All chassé across past partner (man behind lady) to meet the next; set right and left to them. Chassé back (again man behind lady) set to partner. B: (40 bars): First lady and her opposite man forward and back. Cross over. Facing each other (inside the set), chassé right and left. Cross over. All balancez to corner. Two-hand turn about half-way into lines at the head, with the man on the left (4 bars, so take your time). Join hands in lines and go forward and back. Men moving in front of your corner, all meet partner for a two-hand turn to place. A1 All take a cross-hand hold and promenade round the square. Second lady, third lady and fourth lady lead the same figure in turn. A2: Finally, all chassé across; set right and left, Chassé back; set to partner. 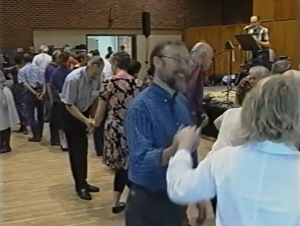 Ralph Sweet called four figures of The Plain Quadrille at the Ralph Page Dance Legacy Weekend in 2000. Click the image on the right to see it — I've started it as the dance starts, but he gives some interesting background before that. His version comes from a book published in 1890, but I imagine he's added some moves from later American Squares. It looks and sounds like a traditional American Square, but you can see that the first figure comes from the original version and his third figure has similarities to the fifth figure of the Belle Brandon Set on my “200 Years of Anerican” page. The Quadrille was introduced into English Society by Lady Jersey and her friends at 'Almacks' in 1816. Originally figures were put together by the dancers themselves, but Wilson's Treatise on Quadrille Dancing of 1818 describes fifty different moves and suggests how they may be combined to make figures. Many of these moves were Cotillon figures already familiar to English dancers. One of the most popular books of the period was Payne's Six Sets of Quadrilles (1820) — the First of which was a Set that was already so popular in Paris that by the end of the 18th century it had superseded all the others. This was the set which Lady Jersey introduced at Almacks and ultimately the form in which the Quadrille was danced in England, as the First Set of the Quadrilles, although there were numerous variations to chose from. The fourth figure — La Pastourelle — was often replaced by a further figure La Trenis (named after the dance Trenitz) in fact, in the Viennese Quadrille both were danced — as fourth and sixth figures. The music for the quadrille sets was made up of lively rhythmic themes of rigid 8 or 16 bar lengths — the sections much repeated within a figure. Except for La Poule and sometimes Le Pantelon (which were in 6/8) the music was in 2/4 and usually adapted from popular songs and stage works. In England the Quadrilles of Jullien, such as the British Army Quadrilles and the Grand Quadrille of All Nations were great attractions at his concerts in the Surrey Gardens and Covent Garden. Elgar also wrote music for the Quadrilles during his years as conductor at the Powick Asylum (1879-94). Elsewhere in Europe quadrilles were produced by the Strausses and all the major dance composers of the 19th century. The Historical Dance Society (formerly Dolmetsch Historical Dance Society). Both are serious academic groups, though not serious in the sober no-nonsense meaning — they enjoy themselves but they strive to research the dances and do them properly. The Historical Dance Society has published two books — “Dances for Jane Austen” and “More Dances for Jane Austen” — which are well-researched and very readable, explaining the steps and figures, with accompanying CDs of the music. I've already mentioned regencydances.org which has a lot of information and also some animations of dances — people say a picture is worth a thousand words! […] country dances could be devised on the spot by the head couple, but that was not the only practice. Note re The Honeymoon, that Fanny Austen records dancing that by name. Although tunes were sold with a variety of figures, probably in your own community (whether local or social) some tunes and figures went together regularly — later becoming 'traditional'. quadrilles.co.uk is Ellis Rogers' website — you can see a video of his Quadrille Club above. Ellis has led research and practice in quadrilling in the UK for many years and has published a large book, “The Quadrille — A practical guide to its origin, development and performance”. available from him. The Quadrille Club meets once a month in London. These are from my repertoire as a caller; of course there are lots more. Some of the dates may be slightly wrong. As you can see, many of the triple minor dances have been converted to 3-couple dances. I host a tea and teach English Regency dancing on third Sundays in Pasadena, California, USA. Since I am not yet an expert on the subject, I constantly strive to learn more about the period and the dancing therein. Admittedly I do attend and dance at English Country dances, however, sylistically what I teach is not from the standpoint of folk dance. On the contary my interpretation is in the fashion of aristocratic ballroom dance in England from 1795 to 1830. It is smooth and with a light quickness, and I'm guessing not a lot of vertical motion. Regency aristocrats probably moved with an elegance and ease never to be seen again in history. A blend of non-rigid upright posture, and an ease of stance without slouching. It would be compared to the difference between Pride and Prejudice's Meryton and Netherfield balls. Your article on Regency Dance is most enlightening. I have discovered a real treasure in it and am learning a lot from it. For example, a jetee assemble would certainly serve to mark the end of a figure. Even though for the sake of accessibility I do not teach much footwork I am thinking of introducing that step at my next 'drum'. I hope to have the pleasure of communicating with you in future. Thanks very much for your message; I'm glad you're finding the page useful. Please contact me again if you have any questions - though I'm not guaranteeing I can answer them!